The perpetual ten year-old has showed off his muscle power in the Pokémon anime several time. 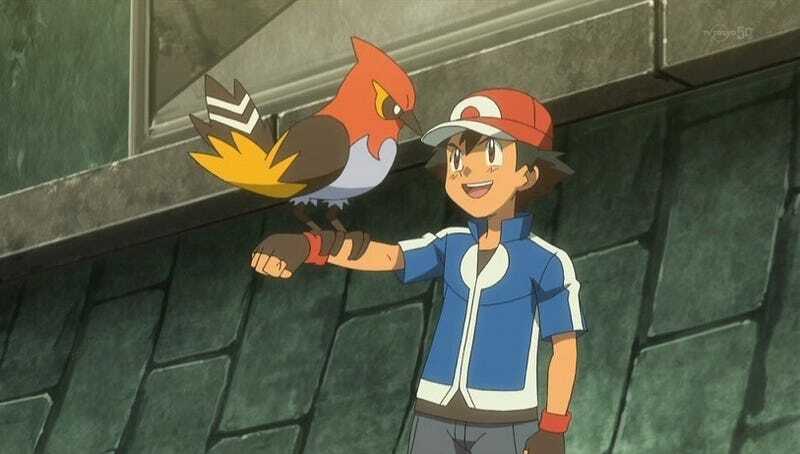 In the above photo, for example, you can see him hold up Fletchinder with one arm. Fletchinder weighs 16 kilograms (35 pounds)! Look how effortlessly Ash picks up Pignite, who weighs 55.5 kilograms (122 pounds). Ash carries Larvitar, who weighs 72 kilograms (158 pounds), like it’s nothing at all. Here Ash is holding up Hippopotas and Pikachu as he climbs up a cliff with one arm. Hippopotas weighs 49.5 kilograms (109 pounds) and Pikachu weighs another 6 kilograms (13 pounds). Froakie weighs 7 kilograms (15.4 pounds), while, as mentioned above, Pikachu weighs 6 kilograms (13 pounds). The only explanation for this is that always carrying Pikachu around has made Ash one macho kid. But he isn’t the only abnormally strong child in the anime. Here is Pokémon performer Serena, with Sylveon, weighing 23.5 kilograms (51.8 pounds), walking up her arm. In this scene, she held both Pancham, who weighs 8 kilograms (17.6 pounds), and Fennekin, who weighs 9.4 kilograms (20.7 pounds) with ease. She must bench crazy weight for a kid. Or maybe she just lifts Pocket Monsters? Bonnie, who is an aspiring Trainer anywhere between five and eight years old, also has impressive strength. Here, she holds Dedenne, who weighs 2.2 kilograms (4.9 pounds), and Core Zygarde, whose weight I don’t think has been disclosed, in her pouch, no problem. This is one strong child. Pokémon Trainer? More like weight trainer. This article was originally published on October 13, 2014. It has since been updated and expanded with more examples.